France – Puy du Fou has used a large number of Clay Paky fixtures to light its flagship live show – Cinéscénie. principal lighting designer, Koert Vermuelen, deployed Clay Paky’s Alpha Beam 1500s and Sharpys to create the sensational light show, which ran throughout the summer months. This year, the historical theme park celebrates its 25th anniversary and Cinéscénie heads up a programme of live productions at the cultural attraction, which first opened in the heart of the Vendée region of Western France in 1989. 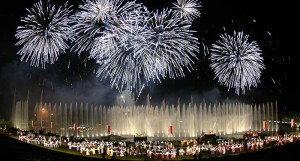 This summer, the show, which lasts 1hr 40 min, has reached over 10 million spectators and is described as the largest night-time show on earth. Taking place every Friday and Saturday, the show featured 1,200 actors, 300 animals, 24,000 costumes, 1,000 fireworks, 3,000 projectors, and a 23-hectare stage! The brief from Puy du Fou asked for a complete re-design of the lighting concept. Vermeulen worked alongside Pavla Beranova, Jean Jacques Deneumoustier and Jimmy Stas from the ACT Lighting Design team and Damien Botton from Puy du Fou’s technical team. Together they designed a concept that incorporated both standard and custom-made lighting fixtures. The fixtures were positioned throughout the site and complex programming techniques were used to control and sync the lighting with the other aspects of the show. "The Clay Paky Alpha 1500s and Sharpys along with a number of other bespoke made lighting effects and techniques enabled us to create new drama for the show lighting," explains Vermeulen. "We sculpted the space out of the darkness using the narrow beam capability of the Alpha 1500s as side and key light along with colourful front light and foot lighting using custom made RGBW LED fixtures. In addition we provided strong architectural feeling back-lighting with banks of Sharpys. "Thanks to these robust technologies we were able to create a real sense of dimension, volume and depth to each principal scene, while at the same time achieving new dramatic effects in terms of colour changing and fixture positioning, plus a number of extra looks that really highlighted specific scenes." 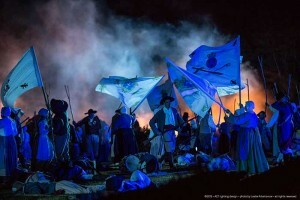 However the lighting concept didn’t just have to deliver unforgettable performance; it also had to meet the organiser’s environmental considerations as Vermeulen explains: "The new creative lighting concept was based on layers of light, which were built meticulously and specifically around each one of the performance themes. We highlighted certain artistic performances to deliver a stunning visual impact across the entire site, while at the same time respecting the challenges we were set of achieving very low energy consumption." Both the Clay Paky Alpha 1500 and the Sharpy offer a seriously high output for their relative low power consumption. In addition they are reliable and robust fixtures that can deal with most environments. In particular the Sharpy is just 189W yet offers unprecedented brightness, usually only achievable with far greater wattages. The Sharpy is also lightweight and features a modest footprint allowing it to fit pretty much anywhere, no matter how awkward the space. In addition Sharpy offers 14 different colours and 17 gobos and can produce a perfectly parallel, laser-like beam, which enabled Vermeulen to create an array of spectacular mid-air effects. Week after week, audiences filled the spectator areas of the site and left in awe of the unique and stunning spectacle. Many have since giving glowing online reviews. Feedback from the client has also been positive: Philippe de Villiers, founder of Puy dy Fou, comments: "Thanks to Koert and his team a new lighting design concept has been realized, which has seen Puy du Fou became a living impressionist painting. 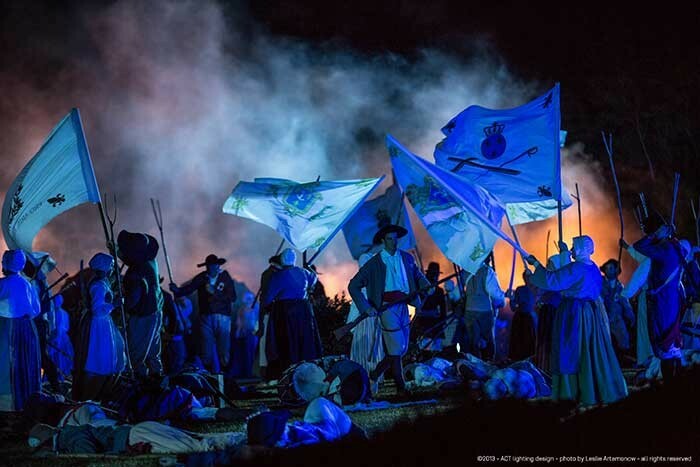 Koert has ensured that this exceptional live spectacle, supported by 3,200 passionate volunteers, is able to tells its heroic story, while surprising and moving the audience every night that it plays."